Looking to add a little spice into your students' map use? Not happy with the maps in your boring, paper atlases? Well, then maybe it's time you try TimeMaps. This free site provides you with tons of interactive maps of World History. You can hit "play" and watch how things change/progress over time. 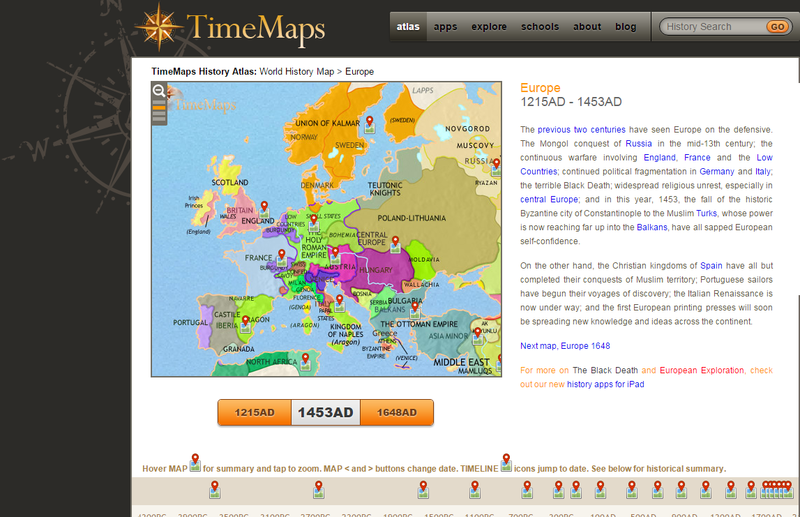 On the map, you will find images to click to get further detail/info about that particular region/time period. There are over 1,500 maps, historical overviews, and in-depth articles, images, etc. This is more than just maps. It's a maps website with power. You can zoom in and out to get the viewing experience you want. This could be a major element of a lesson, or simply provide the link to your students for them to have an opportunity to discover something new and share it.